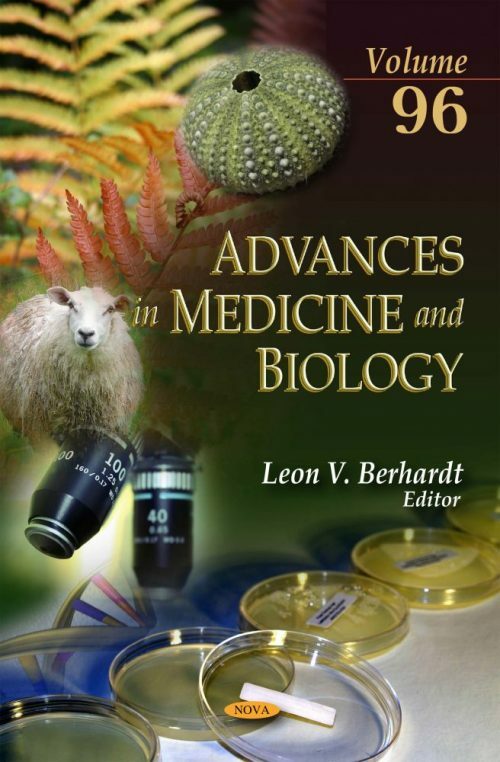 The chapters in this volume of “Advances in Medicine and Biology,” present the latest research in medical research. The first chapter provides recent findings from animal studies and human intervention studies are reviewed and evaluated with respect to the preventive/protective effects of cranberries against metabolic syndrome, type-2 diabetes, and cardiovascular disease. Chapter Two discusses the use of the North American cranberry to decrease matrix metalloproteinase activity in aortic smooth muscle cells in vitro, which occurs via modulation of key cellular signaling activities. Chapter Three examines how dietary whole cranberry modulates plasma cholesterol profiles and prevents liver toxicity in response to cholesterol-feeding in the JCR. Chapter Four discusses the known characteristics and functions of macrovascular pericytes and describes the role of these cells in the development of atherosclerotic lesions. Chapter Five reviews the putative role of pericytes in thyroid gland and rare/orphan thyroid tumors. Chapter Six discusses the synthesis, regulation and physiological effects of the luteinizing and follicle-stimulation hormones in women. Chapter Seven presents the epidemiology of legionellosis as well as clinical features and control strategies of the microorganism. Chapter Eight provides insights on neuronal vulnerability and astrocytic abnormalities during stroke. Chapter Nine provides an overall perspective of Chronic Kidney Disease (CKD) and the potential role of the Scientist in the Community. Chapter Ten describes the active regulatory process that maintains corneal avascularity, describes the pathogenesis of the neovascular process, provides an overview of the most common aetiologies of corneal neovascularization (CoNV), as well as current and future treatments available. Chapter Eleven describes the clinical, histological, and molecular changes occurring in the skin after ultraviolet radiation (UVR) exposure, and reviews the specific cellular and biochemical mechanisms contributing to the clinical phenotype of photoaged skin. The last chapter studies medication error reduction at transitions of care through a better multiciplinary intervention.